New radial velocity measurements obtained since June 1st 2017 using HARPS. As in the other plot, the blue line is the best fit to a two sinusoid solution. Looks like the signal of Proxima b is holding well (phew! ), but more data will be needed to figure out the nature of the second signal. The files are regular text (ASCII files) and can be imported to analysis and plotting tools such as Excel, LibreOffice, gnuplot, etc. The new data is showing interesting features when combined with previous ones. To avoid biasing you and our colleagues, we will refrain ourselves from commenting for now! 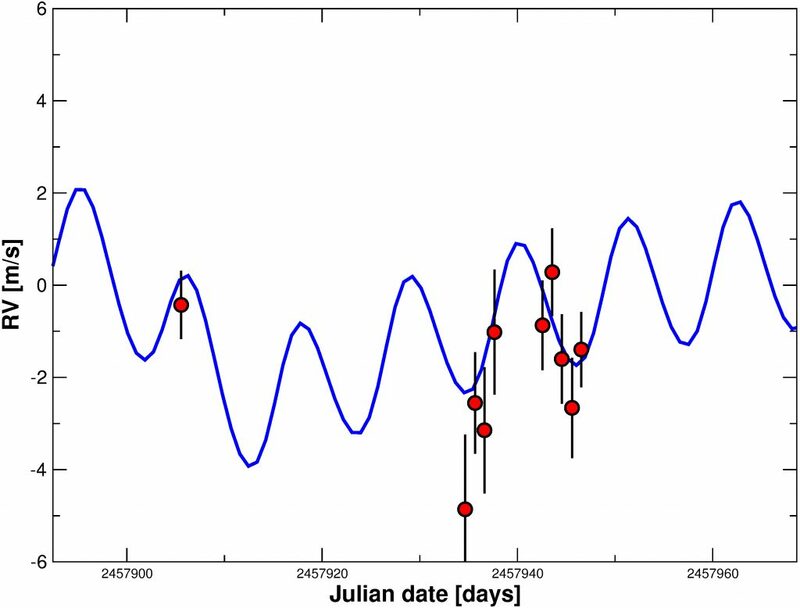 Radial velocities from Proxima Centauri as obtained by HARPS on 2016 (Pale Red Dot campaign). The blue line is the best fit model to two signals; Proxima b’s one and some longer term variability of (yet) unclear origin. 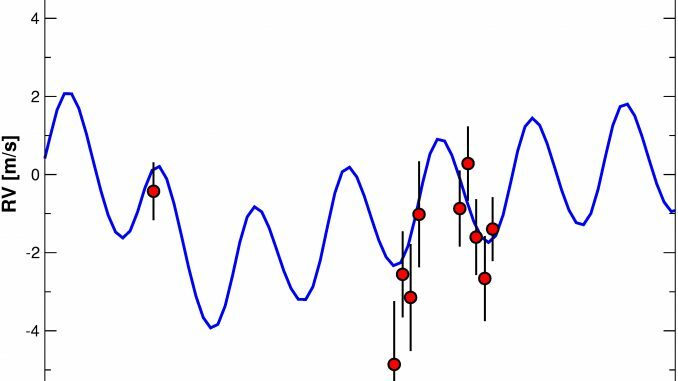 If you have opinions and/or things you would like to discuss about the time-series and the spectra, please do so in the comments to this post, or via social media (including the @RedDotsSpace (Facebook and/or Twitter) or hashtag #reddots. 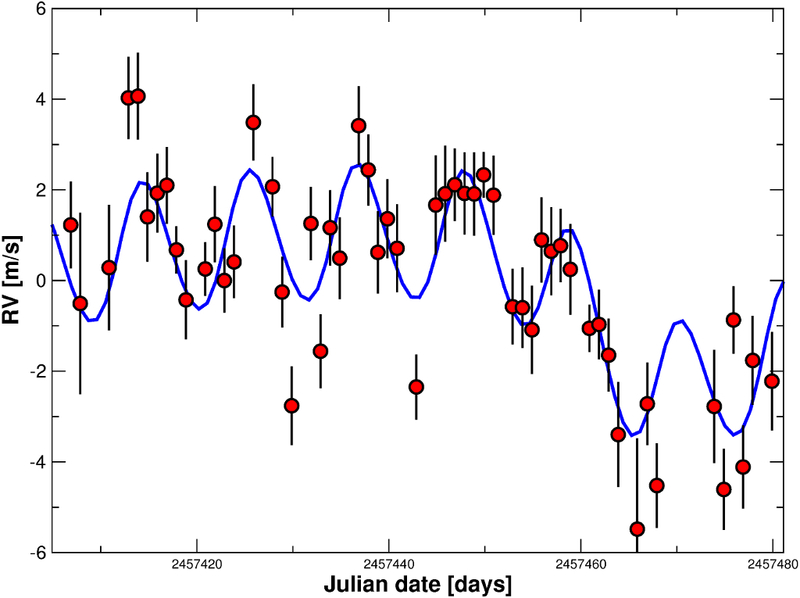 Photometry and comments on the other stars to follow soon! Thank you guys for your amazing project and the opportunity to watch online the discovery of new worlds! Going to try to analyze your data and see if we can see something missing professionals. :) Good luck to all the participants of the project! Proxima B has a moon. Proxima b may or may not have a moon but the Doppler measurements we are obtaining cannot tell us that. The reason is that our measurements are on the star. It is the indirect pull of the planet that makes the signal. If the planet has a moon, we would see all combined in the same 11.186 days periodicity as the combined mass (from the star point of view, the moon and the planet behave like a single object). I hope this helps!